This article appeared in Fall 2008 issue of Texoma Living!. The ice cream was too cold, and that got J. F. McCullough to thinking. Mc-Cullough and his son Alex had started the Homemade Ice Cream Company in Davenport, Iowa, in 1927, and they had done pretty well, eventually moving to a former cheese factory in Green River, Illinois, and converting it to make ice cream mix. When the mix came out of the freezer, it was relatively soft, like homemade ice cream fresh off the dasher. Only after it was packaged and left to ripen in a subzero freezer did it become hard, solid and icy cold. McCullough thought the mix tasted best before it got hard because the cold ice cream numbed his tongue. If he liked softer ice cream, maybe his customers would too, so to find out, he set up an experiment. He got Sherb Noble, who bought a lot of ice cream from the Homemade Company, to promote an “All You Can Eat Ice Cream for Ten Cents Day” at his store in Kankakee, Illinois, on August 4, 1938. In two hours, Noble went through sixteen hundred servings of the softer, unripened ice cream. They tried the test again in Moline, Illinois, with the same results; the customers gobbled up the soft ice cream as fast as the attendants could dish it up. Convinced that he was on to something, Mc-Cullough started looking for a machine to turn out soft ice cream on demand. Son Alex happened upon a street vendor in Chicago who sold frozen custard out of a freezer designed by Harry Oitz. In 1939, the McCulloughs cut a deal with Oitz, and then they turned his device over to Stoelting Brothers, an engineering firm, who made some design changes and produced seventeen machines that would turn out soft ice cream from McCullough’s mix. The freezers were far from perfect. They leaked, they were messy, they were too big, and they broke down a lot. Undeterred, the McCulloughs again turned to Sherb Noble, who opened a store on North Chicago Street in Joliet, Illinois, in 1940, installed two of the Stoelting Brothers machines, and started selling soft ice cream. 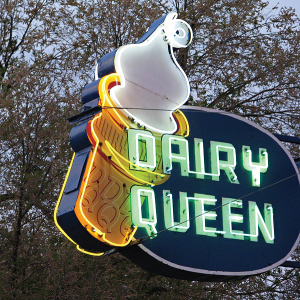 McCullough came up with the name Dairy Queen because, he told people, his mix was the “queen” of dairy products. A triple cone was a nickel and the sundae went for eight cents. Dairy Queen #2 opened in Moline in 1941, and then came #3 in Aurora and #4 in Davenport, Iowa. Jim Elliot, who ran the Moline Dairy Queen, got tired of the constant attention required to keep the ice cream machine working, so he got Henry Duke, who manufactured laundry equipment, to see if he could improve on the Stoelting Brothers design. Improve it he did, and before long Duke gave up the washing machine business to concentrate on ice cream machines. Today, the H.C. Duke Company makes most of the machinery used in Dairy Queens all over the world. So where did DQ get the curl? No one seems to know, although somewhere along the line the company trademarked the symbol, so now it is all theirs.